Lift it... Move it... Safely! Gantry Cranes handcrafted by eme. The worlds finest aluminum Gantry Cranes – light, strong, easy-to-assemble, easy-to-move under load, and safe. Davit Cranes handcrafted by eme. We manufacture the world’s first 1-ton Davit Crane – both regular and extended radius and lift-height models. With Custom Gantry Crane Solutions. 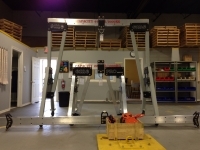 What ever your lifting challenge, look to the experts at eme for a custom solution that works. All products manufactured by eme come with an industry-leading warranty and quality guarantee. Easily Moved Equipment Inc. is the market leader for Gantry & Davit Cranes. Easily Moved Equipment Inc. (eme) is the North American market leader in portable lifting equipment for maintenance. We manufacture portable, lightweight aluminum Davit Cranes and Gantry Cranes that come with an industry leading warranty and safety record. We like to say that 'we make tools, not toys'. 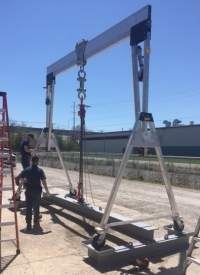 When you purchase a Davit Crane or Gantry Crane from eme, you get a quality product that does what you need it to do, safely, over a lifetime. Whether you need to lift a truck motor for maintenance or launch a mini-submarine through the arctic ice, look to eme for the world's best Gantry & Davit Cranes. For straightforward projects, our standard Gantry & Davit Cranes may provide the perfect solution. However, if you have specialized lifting needs, or difficult project parameters, we can help you think strategically to design a custom solution. Discover eme's Gantry & Davit Crane solutions. Save time. Save money. Be safe. The 7.5 tonne Aluminum Gantry Crane is here! Raising the bar for Gantry Cranes. Do you have a situation where a Standard Gantry Crane just might not be able to do the work? A broken part is a poorly designed part – we are definitely not in the parts business and never want to be. We make our products to last...and guarantee it!